Transitional Justice Commission are unacceptable and have damaged its reputation. 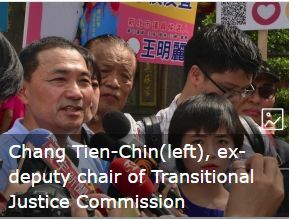 The Transitional Justice Commission was established under the Tsai administration to address historical injustices during the one-party era. It has passed a number of controversial laws since its inception, including ones that allow it to nominate members with no government supervision. A recording of the commission’s deputy chair, Chang Tien-chin, was leaked on Tuesday. In the recording, Chang said he planned to spread negative information about Kuomintang candidate for New Taipei mayor Hou You-Yi. Chang also said the commission will become the “Eastern Depot”. That refers to the ancient secret police agency that spied on government officials and silenced political dissidents.